Your playground represents not only a long-term investment, but a safe haven for children of all ages and abilities. If properly maintained, it can provide fun and exploration for decades. Playground Guardian is a full service playground management and maintenance solution that will help you successfully manage and maintain your parks and playgrounds. In addition, Playground Guardian can perform a few minor maintenance items such as tightening bolts, "S" hooks etc. Playground Guardian can also provide training for your staff on playground maintenance and management. RENEW: Make your playground NEW again! 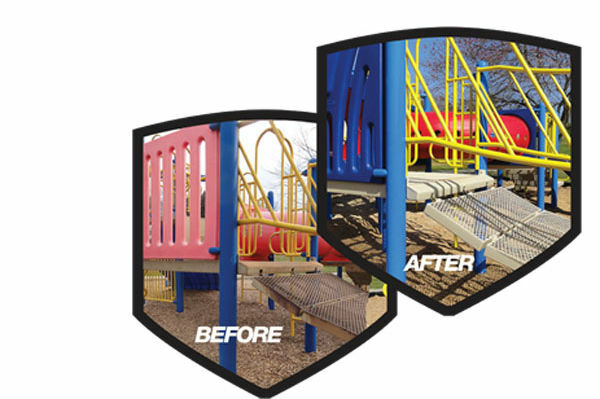 If your playground is worn and weathered, but you are not in the market for a completely new playground, try our proven RENEW program. See the difference with our proven reconditioning methods. Thank you for your interest in Playground Guardian! Please complete the following form, and we’ll contact you within two business days.